Prosciutto wrapped breadsticks are one of the fastest and easiest appetizers you will ever make. They are great for any last minute dinner since they require very little prep time and absolute zero cooking time. And they only require two ingredients! I feel silly calling such things recipes, as two ingredients with no cooking can’t really be called a recipe, but I realize that a lot of people need a little help in the cooking department- even with such an easy idea. I had forgotten all about prosciutto wrapped breadsticks until I saw a photo of a Christmas Eve my mom hosted some time in the 1990’s. 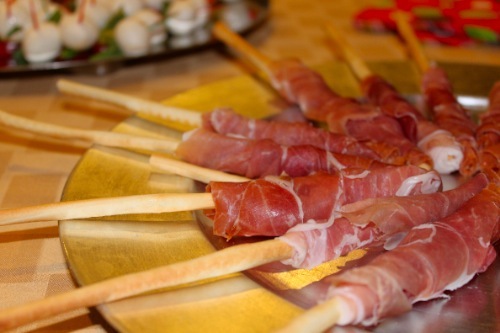 Wrap a piece of prosciutto around the edge of each breadstick. Serve immediately. Enjoy! Any other quick and easy appetizer ideas? I love how easy you make party preparing/planning look! I have to say my go-to easy peasy recipe is just goat cheese and crackers. People love it and I sometimes roll it in toasted almonds for crunch! They are so pretty! 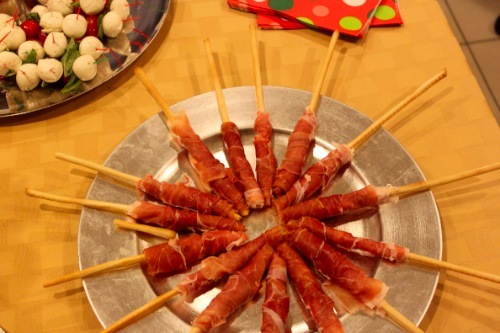 Josh is a HUGE prosciutto fan…he’d love these. Maybe a to make for New Years Eve? Often the simplest things are the best. I have never seen these before. I like making easy dips, like roasted red pepper and goat cheese with lots of dippers like crostini, veggies, crackers. I could easily make a meal out of little appetizers! I had a friend do something very similar to this at a holiday party I went to recently! They used bacon and completely wrapped the breadsitcks, baked them, and then cut them into smaller pieces (a little larger than bite size). They were a HUGE hit at the party! I haven’t had prociutto wrapped around a breadstick in years. I might have bring that back for the next event. I usually do prociutto wrapped around cantaloupe. I know it sounds weird but it tastes so good. @Carla, Doesn’t sound weird at all! We do that sometimes too!